Imagine a simple rural farming community in which the people provide for their own and each other’s needs, trading among themselves and helping each other, and get along just fine with comfortable, if modest, homes and plenty of food even with near zero GDP. The families who occupied Cades Cove in the Great Smoky Mountains in the late 19th and early 20th centuries were pretty close to that though they did make occasional purchases of basic staples and tools from merchants in nearby Maryville and Knoxville. If that lifestyle appeals, dream on. 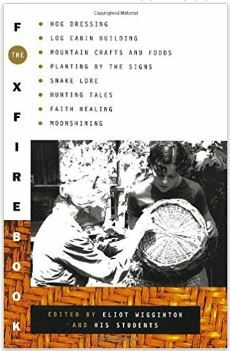 We aren’t going back to it in any case short of global disaster of some kind wiping out much of the population in which case there will be a run on Foxfire books by folks wanting to learn those old survival skills. So, we are stuck with GDP as an important indicator of how well we are doing and with needing ample supplies of cash or credit to do almost anything. An opinion piece in the current Time Magazine, Why GDP is a Faulty Measure of Success by David Pilling caught my attention and reminded me of a post I did a few years back titled Good GDP, Bad GDP. Some of that post is updated below along with comments on Mr. Pilling’s book. Mr. Pilling argues that GDP does not correlate well with the living experiences of many lower income folks having trouble getting jobs and raises while being told that the US economy is booming. 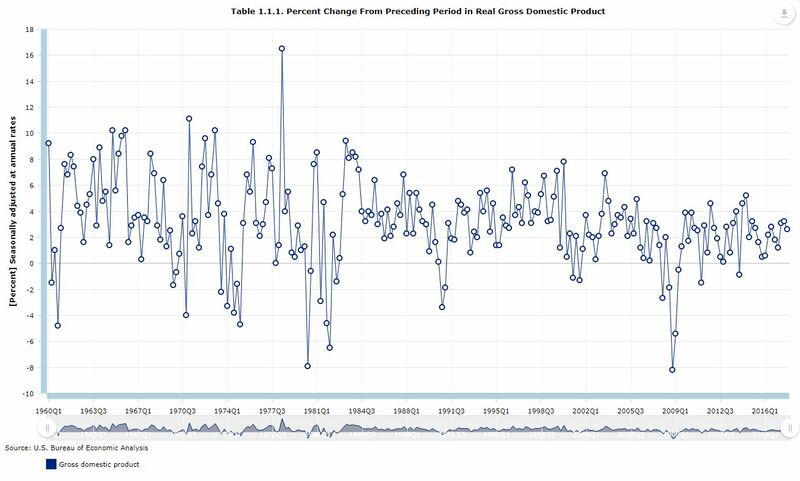 That false good news of a booming economy is irrational exuberance based on small short-term increases in GDP growth (2.6% in the latest release) that ignore historical context and the important related variables of productivity and population growth. The Pilling article suggests that “the US economy has been on a near relentless upward path since the 1950’s” but ignores the decrease in the rate of increase, the doubling of the population during that same time period, and simultaneous increases in productivity, all of which tend to depress labor markets and wages. Below is a long term chart that clearly illustrates the decreasing rate of increase. That last point out there on the right is the recently announced 4th quarter 2017 estimate of 2.6% real growth. So, yes, the long term trend of increasing GDP continues, increasing in 88% of the quarters since 1959, but there is no evidence of any change in the long term downward trend in the rate of increase. In my prosperous younger working years, it was averaging around 4.5% per year. Now it is more like 1.5% per year. 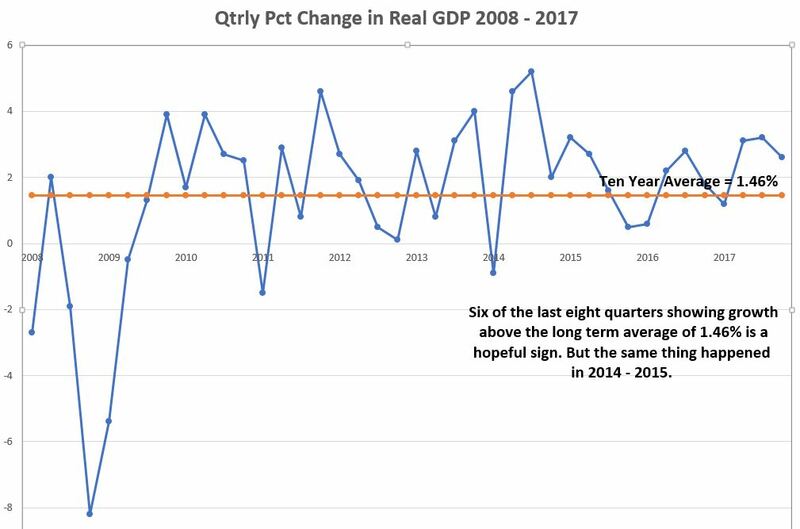 For the last forty quarters, 2008 through 2017, the average growth rate of GDP has been only 1.46%, largely accounting for our Decade of Discontent. 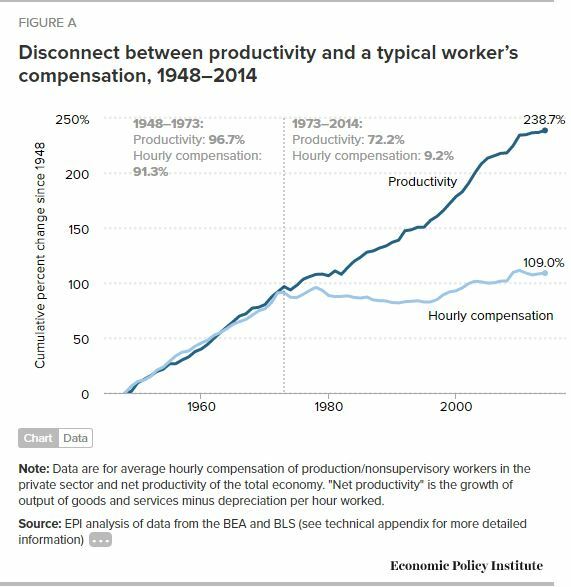 Below is a productivity and wage growth chart published by the Economic Policy Institute. The chart shows productivity growing at about 2% per year. So, if productivity is growing 2% per year and population is growing 1 % per year, we need 3% per year in GDP growth just to stay even in job and wage growth. With 4% per year GDP growth, we could begin to pay down our debts and create enough jobs to result in some real wage increases since employers would be forced to compete to hire and train workers. GDP ignores the things we do for ourselves such as preparing our own food, mowing our own lawns, raising and sometimes even educating our own children, repairing our own cars, etc. GDP includes wasteful and foolish spending the same as wise and frugal spending. Even ill-advised failed investments such as the recently abandoned nuclear plant in South Carolina counted as GDP as will the cost of dismantling and/or protecting it. GDP does not include spending on used goods since that would count the same stuff more than once. No wonder the government wanted to destroy all those used cars taken in during the “Cash for Clunkers” fiasco. It would not have helped GDP at all to sell them, while paying somebody to destroy them was a positive. GDP is supposed to exclude spending on illegal activities such as drugs, prostitution, and burglar tools, and some gambling is not counted, but spending on correcting the problems caused by those vices (legal and medical fees, courtroom costs, prison costs, etc.) is counted. GDP excludes the value of millions of hours of volunteer work but includes fees for ignored advice from consultants and physicians and other professional advisors. GDP includes spending of borrowed money, even billions borrowed by our government. So, what are we to do about our decreasing participation in the economy and “unsatisfactory living experiences” of an increasing proportion of our population? As a football coach might say to the team, our economic success depends more on talent and attitude than on statistics, and we need to forget GDP, forget depending on the government to bail us out, get our attitudes right, and get to work doing something worthwhile for somebody. As FDR’s Treasury Secretary, Henry Morgenthau, confessed on the eve of US entry into WWII, as the Great Depression dragged on, “Now, gentlemen, we have tried spending money. We are spending more than we have ever spent before and it does not work.” Unfortunately, in that case, it took WWII to get our attitudes right. Right attitudes will boost GDP, and getting real GDP growth consistently back above 4% per year would solve many of our problems, especially if it is “Good GDP.” One important attitude booster involves lower marginal tax rates and fewer fees and regulations on businesses, especially small businesses. I hope that is underway.